Juan Gonzalez Wins 2010 George Polk Award For Exposing $80 Million Bloomberg Administration Scandal | Democracy Now! 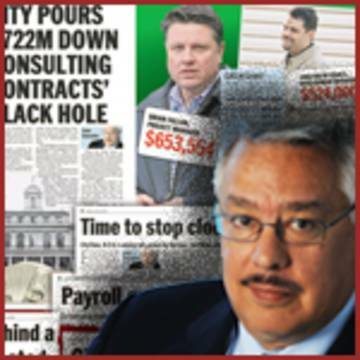 Democracy Now’s own Juan Gonzalez has won a George Polk Award for his columns in the New York Daily News exposing the scandal behind Mayor Mike Bloomberg’s attempt to create a new computerized payroll system called CityTime. Juan’s reporting helped lead to the federal indictment of four consultants and two associates on charges that they orchestrated a fraud that cost city taxpayers more than $80 million. One of seven people so far arrested in the fraud pleaded guilty two weeks ago and is cooperating. The director of New York City’s Office of Payroll has been forced to resign. So far federal agents have recovered more than $27 million in cash from dozens of bank accounts of dummy companies connected to the scheme. Juan also won a Polk Award in 1998.